A minister in the Modi government has publicly attacked secularism and stated that his party is here to change the Constitution. 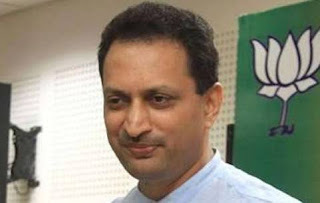 At a public meeting of Brahman Yuva Parishad at the Koppal district of Karnataka on 25 December, Mr Ananta Kumar Hegde said that seculars ‘are like people without parentage, or who do not know their bloodline’. He also said that he is happy if people identify themselves with their caste and religion, but gets suspicious about seculars who refuse to do so. Meanwhile, after public criticism the Minister has apologized in the parliament and said that for him ‘Constitution is supreme’. This apology however should not fool anyone. Doublespeak is an old BJP/RSS tactic. Minister’s comments should be understood in the local context of Karnataka politics and the broader ideological beliefs in India which have lately helped Hindutva fascists expand their appeal. Karnataka has recently seen widespread public demonstrations and outrage against murders of two well known rationalist public intellectuals, namely Prof Kalburgi, and Guari Lankesh. Both were against the Hindutva agenda of the BJP in Karnataka, and are widely believed to have been killed by extremist Hindu groups. Karnataka goes for assembly polls next year. Minister’s comments were clearly aimed at ridiculing opposition to Hindutva in Karnataka and galvanising its core support base. However, the actual politics of Hindutva and its reach goes much beyond this core. Through his talk of ‘no parentage’ and ‘bloodline’, the minister has shown a casteist, patriarchal and feudal mindset. The caste system is based upon strictly controlled patrilineal descent. It valorized savarna castes the only ones fit for learning, bearing arms and commerce, while the majority of Shudras and untouchables were forced into farming, and artisanal and other professions which were devalued. Savarna castes maintained and justified their privileges through their ‘bloodline’. It is obvious that the minister wanted to present his party as the defender of the most outrageous savarna caste prejudices. Similarly, by ridiculing people of would not consider their caste or religion as their primary identity, he has shown a mentality that cannot have a place in a modern democracy. The primary identity of every Indian recognized by the constitution is that of a citizen, irrespective of caste, gender, religion, or ethnicity. No identity can be forced upon a citizen, and if a citizen wishes, she/he can refuse to follow caste or religious diktats, or can even change their religious identity. Democracy gives citizens the freedom to be whatever they wish; but communalism, casteism and racism force into fixed identities and target them on that basis. It is well known that Hindutva is against secularism. It considers secularism detrimental to the interests of the religious majority (which they falsely claim to represent); and a means of appeasing religious minorities. Many broad-minded people who oppose the anti-Muslim and anti-Christian politics of Hindutva also think that secularism is a doctrine concerned only with protecting minorities. This is a limited understanding of secularism. India needs to be secular not only for the security and protection of minorities, but because no true democracy can function without secular values, and a state which does not follow secularism will be against interests of every Indian. Formally speaking, secularism require that that the state refrain from discriminating between citizens on the basis of their religion. At a time when Muslim Indians are being lynched on false accusations of ‘love jihad’, and ‘beef eating’, and when state governments appear more intent on vilifying the victims rather than punishing the murderers, no sane citizen can deny that the secular principle of equal protection of law to everyone is extremely important. Modern democracy is premised upon two fundamental values: equality and freedom. The principle of secularism in this context implies that no religious belief, injunction or text, can be used to violate the equality and freedom of citizens. This is of extreme importance for a society like India, where the equality and freedom of many citizens are routinely violated under the garb of religion. For example, the untouchability sanctioned by the Hindu caste system which meant that untouchables were humiliated at public places was outlawed by the Constitution. Similarly, if ban on entry to public places of worship, or unequal property rights and divorce practices like Triple Talaq sanctioned by religion are found to be violating the right to equality and freedom of women, these too can be made illegal. Secularism is also necessary for the protection of freedom of others who may not consider themselves oppressed. In a secular democracy the freedom to choose one’s profession, life partner, place of residence, food, dress, the right to express one’s ideas, etc. cannot be violated on the basis of religious demands. It is high time Indians realise that the anti-secular and anti-minority agenda of Hindutva is actually against all Indians. A misunderstanding specifically spread by communal forces is that secularism is anti-religious. This is a completely bogus allegation. The overwhelming majority of statesmen who framed Indian constitution were religious persons, who believed that a secular state was best for the country. The majority of Indians who are religious regularly vote for parties which call themselves secular. Actually, secularism is essential to guarantee equal religious freedom to everybody. On the other hand, communalists of every denomination constantly attempt to enforce their own perception of religion on everybody, especially upon the community they claim to represent. The Minister’s comments violate the secular and democratic foundations of the Constitution. It is a matter of shame that a person who holds his office by virtue of an oath under the Constitution has boasted about his party’s intention to demolish that very Constitution. Moreover he voiced them at a savarna caste gathering. This intention of the BJP/RSS is well-known and we should not be surprised. Rather we should call upon Indian citizens to take note of this sinister scheme of the Sangh Parivar and resist it by all possible democratic means. 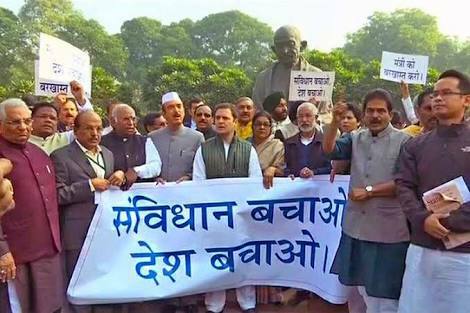 The People’s Alliance for Democracy and Secularism demands that Mr Ananta Kumar Hegde be sacked from the council of ministers. People like him do not deserve to hold any constitutional office.